Best Body Nutrition | In today’s stressful times Well Food Line is looking to replace unhealthy instant meals and processed foods. Healthy snacks and meals can be prepared in a jiffy. The focus is on high-quality protein and tasty flavours. 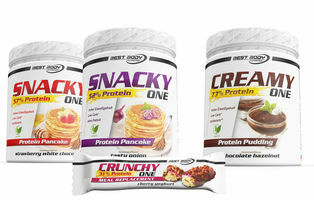 Whether it is the Crunchy One Mealreplacement Bar, Snack One Protein Pancake or Creamy One Protein Pudding, you can find something for every kind of taste. For those that like it hearty, Snacky One Pancake tasty onion is the ideal snack of choice. The Indoor Cycle Group launches its latest indoor cycles. Fitness equipment manufacturer Technogym is proud to announce the launch of its latest product Skillmill: a treadmill which is run without an engine.